HAMPTON ROADS OFFICES SERVING: Virginia Beach, Portsmouth, Norfolk, Chesapeake, Suffolk, Hampton, Isle of Wight, Newport News, Yorktown, Williamsburg, Gloucester, Southhampton, Franklin, Courtland, Northampton, Accomack, Eastville, York, James City, Mathews, Poquoson, Windsor, Ivor, Smithfield, Cape Charles, Exmore, Temperanceville, Chincoteague, Bloxom, Parksley, Onley, Onancock, Melfa, Painter, Belle Haven, Nassawadox, Cheriton, Carrollton, Zuni. RICHMOND OFFICE SERVICING: Greensville, Emporia, Brunswick, Lawrenceville, Mecklenburg, Boydton, Lunenburg, Farmville, Prince Edward , Nottoway, Dinwiddie, Petersburg, Colonial Heights, Sussex, Surry, Hopewell, Prince George, Amelia, Powhatan, Richmond, Chesterfield, Goochland, Henrico, Charles City, James City, New Kent, Hanover, Fredericksburg, Spotsylvania, Bowling Green, Caroline, King William, New Kent, King & Queen, King and Queen, Middlesex, Saluda, Essex, Tappahannock, Warsaw, Lancaster, Northumberland, Westmoreland, Montross, King Geor ge, Totaro, Tuckahoe, Dumbarton, Mechanicsville, Laurel Park, Glen Allen, Bon Air, Lakeside, Laurel Park, Chamberlayne Farms, Henry Clay Heights, Highland Park, Church View, Cross, Millers Tavern, Farnham, Champlain, Sparta, Newtown, Beulahville, Beaverdam, Carmel Church, Gum Spring, Ashland, Short Pump, Midlothian, Morven, Winterpock, Earls, Crewe, Sutherland, Wilsons, Blackstone, Spring Grove, Surry, Claremont, Providence Forge. The Merna Law Group, P.C. is a federally recognized debt relief agency. We assist clients to file bankruptcy under the U.S. Bankruptcy Code. This is a legal advertisement. In order to accept this offer a free consultation must be scheduled and a retainer agreement signed. 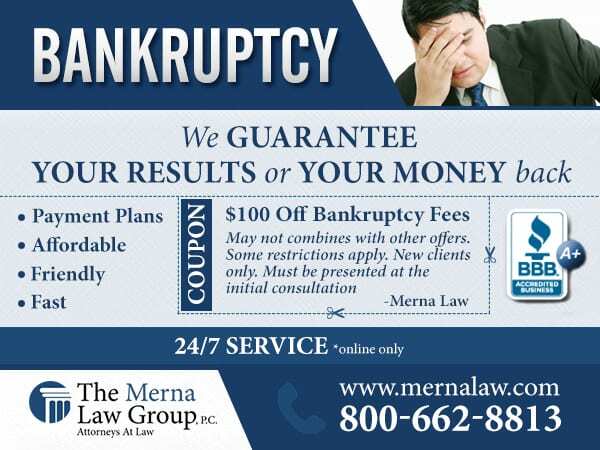 The Merna Law Group can assist you with the filing of a Chapter 7 or a Chapter 13 bankruptcy to halt a foreclosure, garnishment, levy on your property, creditor calls and other creditor collection actions. We are a group of bankruptcy attorneys licensed in the state of Virginia. This offer is not intended for non-Virginia residents. Newport News: 11815 Fountain Way, Suite 300, Newport News, VA 23606. For additional terms and conditions applicable to this ad visit http://divi.mernalaw.com/terms-of-use/.